I went with my friend to a bridal expo and sat inside a limo. "Do you need transportation?" asked Amanda, the owner of Event Shuttle Service. "Yes," I said. "But it's sort of a logistical nightmare." "Let me grab a pen," Amanda said, opening to a blank page in her notebook. "Okay. Go." So I told her I needed a limo to pick up Pete and his groomsmen (for a total, at that time, nine) from a hotel, drive them to the church (in a different town, across a bridge), (come back across that bridge to the town where the guys were) pick me and my bridesmaids up (at that time, nine), drive us to the church (you know, on the other side of the bridge), then all 18 or so of us would need to be driven around to take photos and then to the reception (which is across a different bridge). "That's all?" Amanda said. "That's not bad." 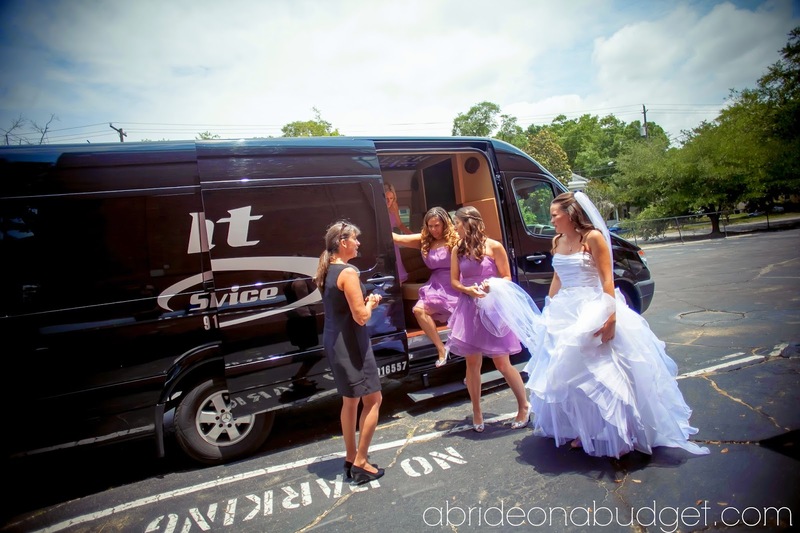 It was so refreshing to know that transportation for our bridal party was not bad. And someone else's problem. All I had to do was tell Amanda where and when and a limo was there waiting. But it got better, really. 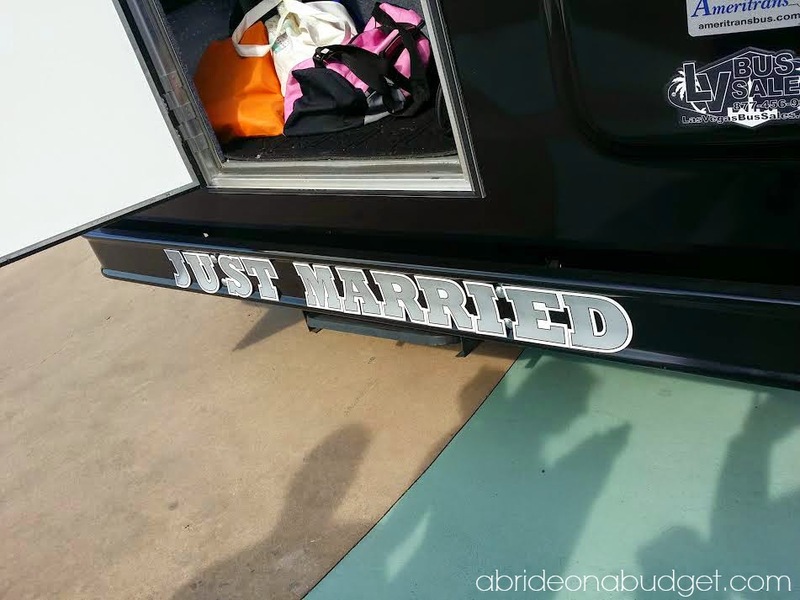 Amanda said she would send a smaller Mercedes Benz sprinter limo to pick the bridal party up and bring everyone to the church. Then, when the ceremony was happening, the driver would bring the limo (and all our bags) back to the depot. Another driver would load our stuff into an XL sprinter and would be waiting for us after the ceremony. Amanda had a specific second driver in mind. He had done weddings numerous times before and would be able to take us somewhere for amazing post-ceremony photos. This is us and the first driver, Theresa. I was so happy with all that. But we didn't stop with just booking for the bridal party. Since almost all of our guests were from out of town and staying at the same hotel, we rented two sprinters to go to and from the hotel bringing guests to the wedding. The sprinters would return after the reception to bring guests back. Amanda assured me that even though we booked the limos until 11:15pm, they wouldn't strand any guests. This is Pete and our second driver. Theresa from Event Shuttle Service picked the guys up in a limo stocked with beverages, drove them to the church, and then we were picked up. At the church, before the ceremony started, one of my bridesmaids looked at me. "Um," she said, "I left the rings in the limo." I was zen bride. I wasn't stressing over anything. "We'll just call the driver and ... " I paused. No. We wouldn't be doing that. Her number was in my phone. And my phone, along with the bag with our rings, was in the limo. All my bridesmaids' phones ... in their purses ... in the limo. Enter our photographer to the rescue. She googled Event Shuttle Service and handed me the phone. To my surprise, Amanda was there and answered the phone. I told her the situation. "No problem," she said. "I'll call the driver and tell her to turn back around." And minutes later, Theresa was back with the rings. Around 11:45pm -- a solid half hour after our rental time was over -- I was heading up to our hotel room with a friend. And I saw Theresa again. "I just wanted to make sure everyone was back to the hotel already. Or do you have guests who still need a ride?" she asked. Everyone is back, I told her, and thanked her for staying the extra time. The next day, my mom told me everyone was so impressed with the shuttles. Not only did it assure that our guests didn't need a designated driver and could enjoy our open bar, the shuttles were stocked with soda and water. At the end of the night, the drivers told our guests to take the rest of the drinks in the coolers. I didn't pay extra for that. It was just really, really great customer service. I was so impressed with Event Shuttle Service (so impressed that this post about why you should book a limo has basically turned into a love letter). 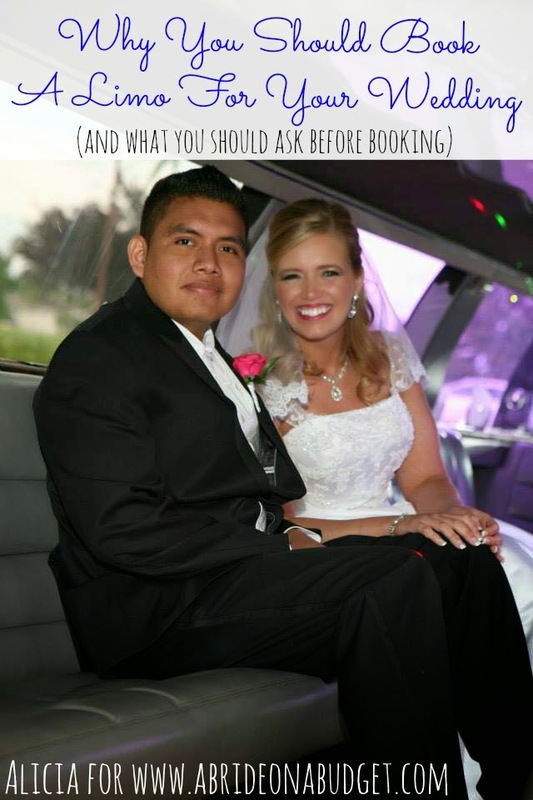 But, the question remains: Should you book a limo for your wedding? 1. No one drives drunk. 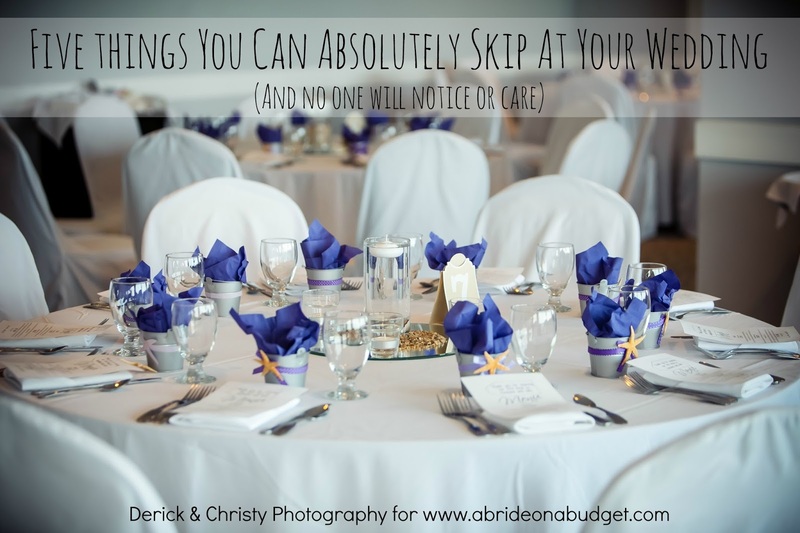 If you're going to have an open bar, you're going to have guests who are drinking. Don't worry about finding them a designated driver or cutting them off so they can drive home. You already booked the driver. Just be sure to let them know before the wedding that you will have a shuttle for them. It'll cost you a couple bucks, of course, but it's worth it. 2. You don't have to drive. You have so much on your mind already, so much to keep track of and so much to do. Just let someone else take care of the driving (and any potential crisis). 3. Your whole bridal party can travel together. If you don't book a limo, everyone has to take different cars. Unless you drive a bus, your party will have to split up in cars. This way, everyone can hang out and travel together. 1. Is the company insured? We have an entire post here about how to find out if your limo company is insured. You absolutely need to make sure of this before you even think about booking. 2. How much does it cost? Find out about any costs, plus any additional costs. If you add on hours at the last minute, what rate are you charged? And definitely call around town. We talked to a few companies to get quotes and the prices varied greatly. Event Shuttle Service offered us the best service for the best price. Seriously, the price we paid was less than half what any other company quoted me -- and most wouldn't switch vehicles for us. 3. Can I see the vehicle before I book? 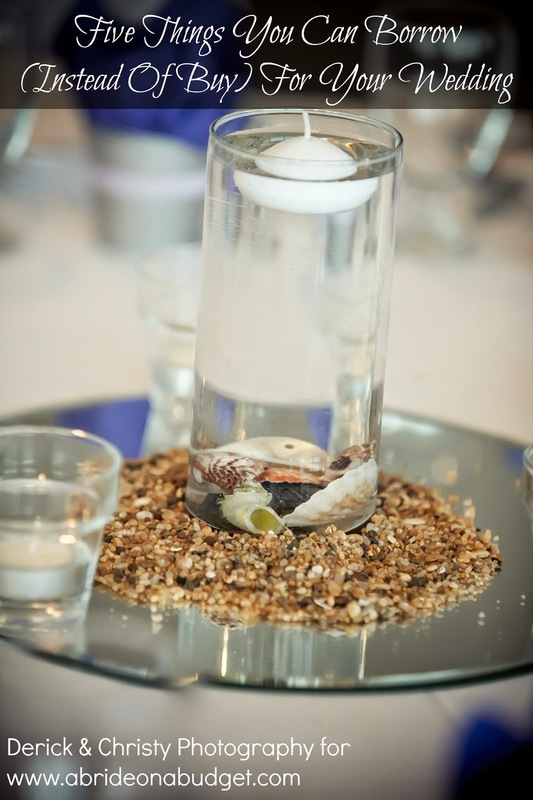 Most major companies will be at various wedding expos, so you'll be able to see them there. But if for some reason you skip the expos, you can head to the company's headquarters and check out the vehicles for yourself. If for some reason they say no, that's a big red flag. You want to make sure you're getting a quality limo. And don't forget to tip your drivers. When we called Theresa to bring the rings back, my first thought was, "Thank goodness we tipped her when she left." I'm sure she would have come back either way, but it made me feel better about asking her to turn around. Plus, the drivers are taking care of you. You should tip them to say thank you. 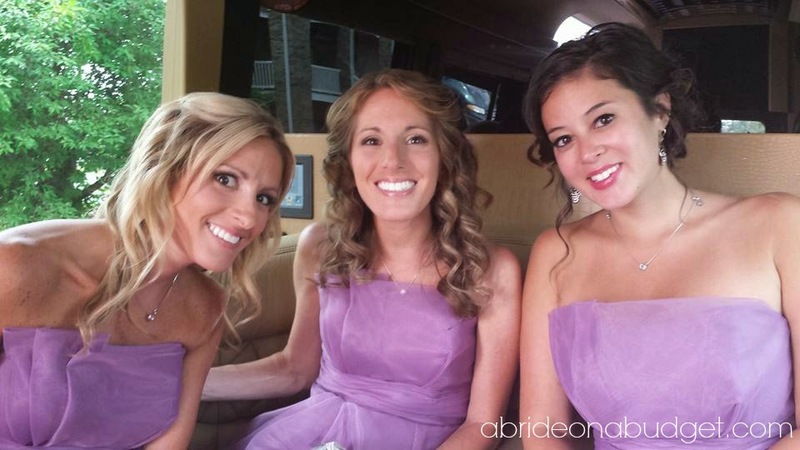 BRIDAL BABBLE: Did you book your wedding transportation yet? I think it is such a good idea to book a limo for the wedding because this will make sure that no one is drinking and driving and it is a good way to get everyone home safe if they all go together! my sister had a limo and it was fun and got us home all safe! 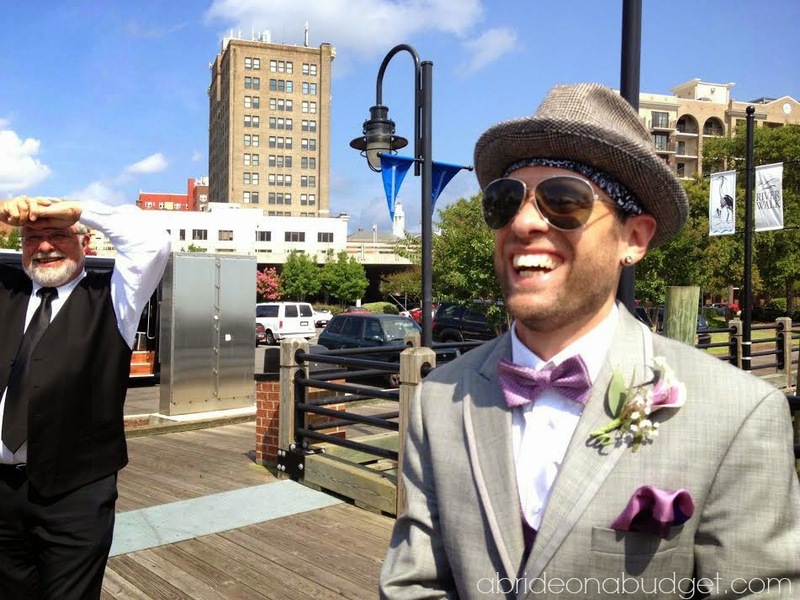 I eloped, but i love the shuttle idea! Thank you for these tips! I will consider a limo now. Oh my goodness! This is so handy! I'm currently finishing up my wedding planning and no...I did not think to look into a limo. Thank you so much for all your wonderful advice Lisa! This is so smart and worth the extra expense. 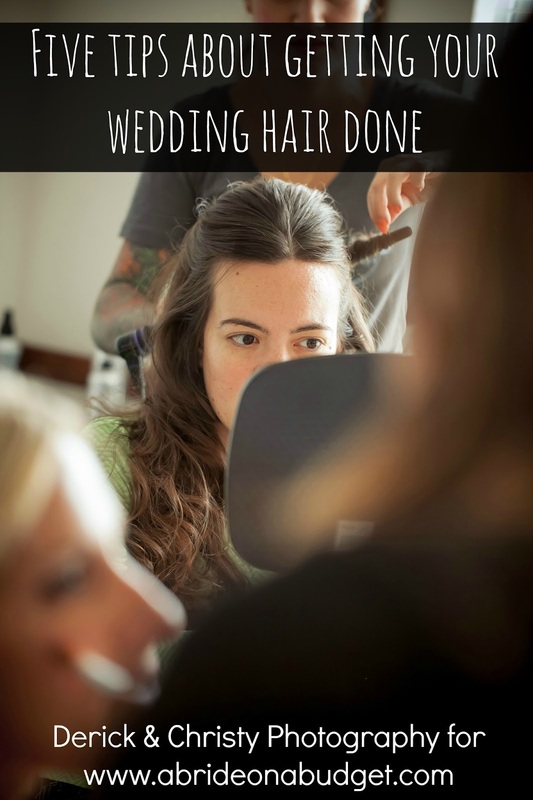 Want to learn all about A Bride On A Budget? Start at our About Us page. Brands ... want to work with us? See all our tip posts here. Amazon Affiliate Disclosure We are a participant in the Amazon Services LLC Associates Program, an affiliate advertising program designed to provide a means for us to earn fees by linking to Amazon.com and affiliated sites.